As the flashing lights of Surfers Paradise dull, the beauty of Broadbeach is illuminated. This stylish precinct of the Gold Coast, once overlooked for older sister Surfers Paradise, is now the heart of sophisticated dining, fantastic shopping, and overall style on the Gold Coast. ‘Broadie’ as it’s known to locals has all the qualities of a relaxed and laid back beachside town mixed with a modern sophistication you won’t find elsewhere. Filled to the brim with dynamic bars and clubs, a premier dining district, a variety of boutique and mall shopping experiences, the Gold Coast’s first all-abilities playground, Broadbeach is an all-round crowd-pleaser and if that’s not enough to convince you, the beaches compete on a world-scale. As the region is immensely popular, finding your perfect getaway spot on budget can be tricky, which is where South Pacific Plaza enters your holiday planning like a spectacular debutant at her ball. 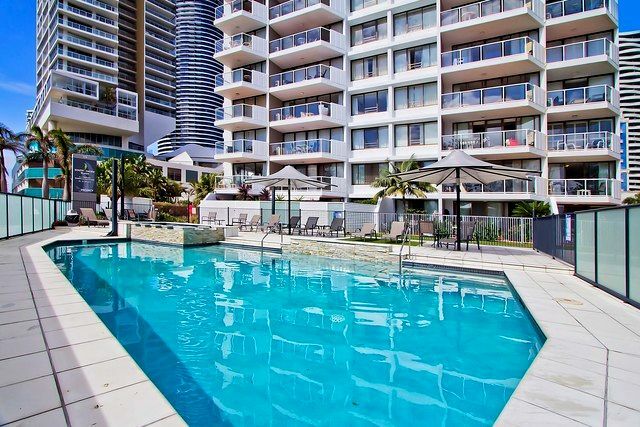 Nestled in the absolute heart of Broadbeach, South Pacific Plaza is front and centre of the action, drowning in restaurants and cafes, smothered with boutiques and shopping centres, and absolutely submerged in panoramic beach views – all of which is not farther than a few metres away. 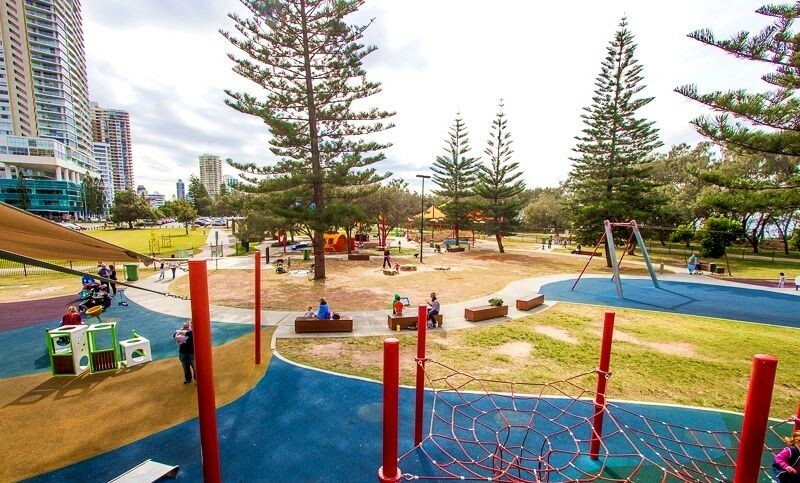 As well as being surrounded by the man-made conveniences of barista made coffee, an easily obtained new outfit, and a 5 star meal at the drop of a hat, South Pacific Plaza is just a short stroll away from the tram line that links the entire Gold Coast, so you can explore the greater region with ease. 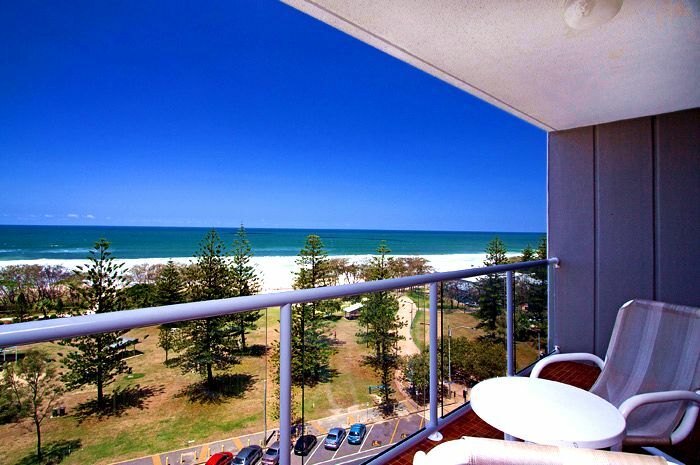 For a day on the beach, look no further than out the front door and across the road! 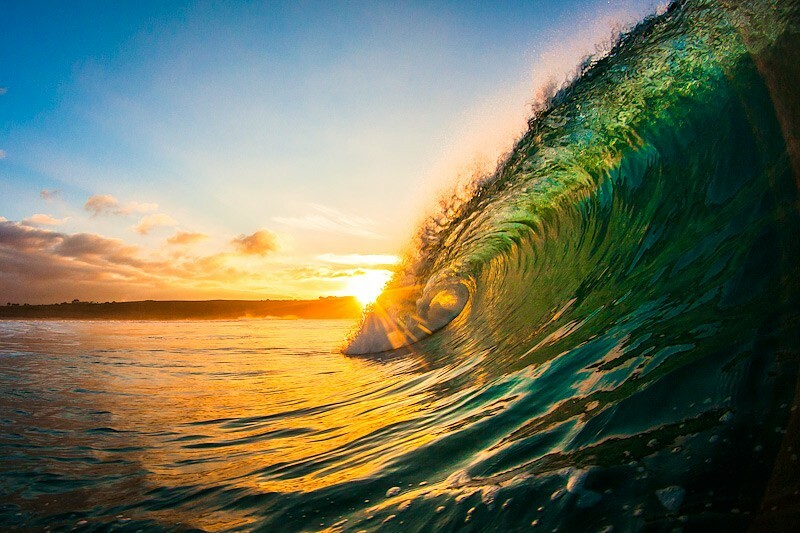 You will have hit aqua surf pounding golden sand framed by red and yellow flags to signify they are patrolled and safe for swimmers to enjoy to their hearts content! Looking inwards, South Pacific Plaza has amazing facilities to be taken advantage of including the crystalline pool, the indulgent spa and sauna, and the full sized tennis court! You can even enjoy an afternoon barbie by the pool, with the spacious green area that’s kept neat, clean, and ready for use. Spacious 1 or 2 bedroom apartments are both on offer in South Pacific Plaza, and neither will disappoint! Sprawling panoramic views of the ocean from the 5th floor and above are ready to please, while below that you can look forward to partial ocean views and luscious hinterland vistas. 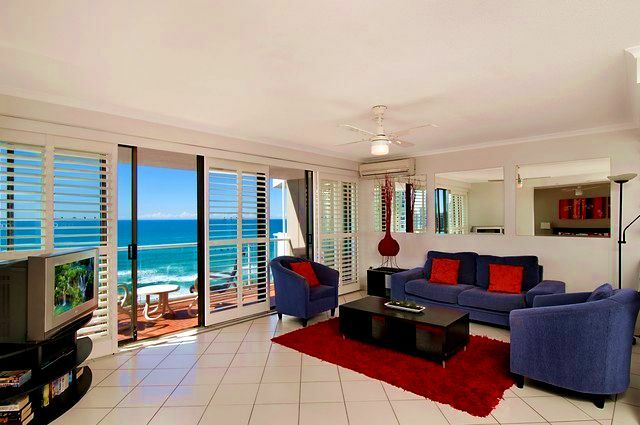 The things you will love about this resort are the fantastic facilities to keep you entertained, relaxed, and amused, breathtaking views that surround and envelop you, and the proximity to all Broadbeach has to offer! If you can drag yourself away from your spacious apartment, getting out and about in Broadbeach is a rewarding activity, there is a fantastic all-abilities playground, Pratton Park, that boasts a great day out for the kids, 24 hour entertainment is just a short walk down the road at Jupiters Casino, with the famed Draculas show and dinner boasting a great night out just next door! 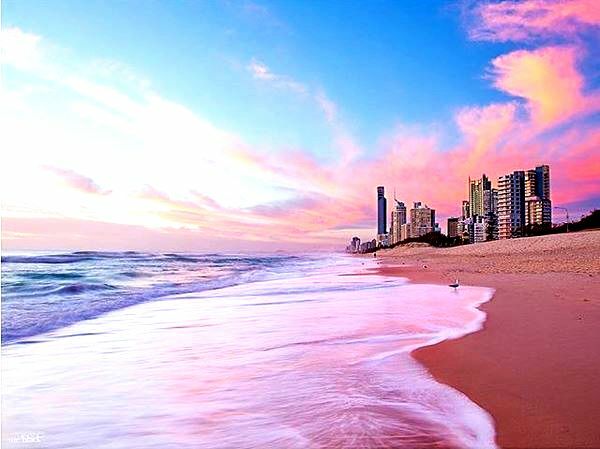 Check out our article for more Things To Do in Broadbeach. This chic beachside town is so many things to so many people, but to most its beach glamour delivered with an urban twist. Escape to the Gold Coast and see it for yourself today.